The year 1553. Miguel Servet is condemned to burn at the stake by the Inquisition. Behind this sentence lurks an unjust judgement, a betrayal, and a cursed book. Religious wars, heretical ideas, a persecuted man, the Inquisition, an unjust judgement, a cursed book... The advances of the Renaissance, the discovery of the circulation of blood, the persecution of heretics, the Inquisition’s witch hunts and executions... In the mid-sixteenth century, during the Protestant Reformation, a man will challenge religious and secular powers, campaigning for freedom of worship and the right to express one’s opinions. El médico hereje is a story full of intrigue, excitement, passion, and betrayal, chronicling the trial and execution at the stake of Doctor Miguel Servet in 1553. 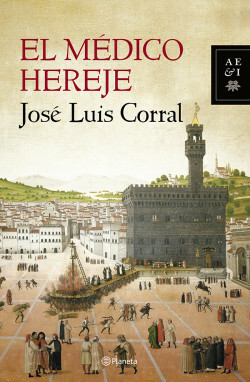 In this new book, José Luis Corral presents Miguel Servet, a relatively unknown figure even though he was responsible for discovering the circulatory system, who was condemned to burn at the stake for heresy. A rigorously researched novel replete with a bibliography and chronology that will delight lovers of historical novels. Miguel Servet is renowned in the world of medicine. The author has been invited to speak about Servet at several medical conferences across the world.